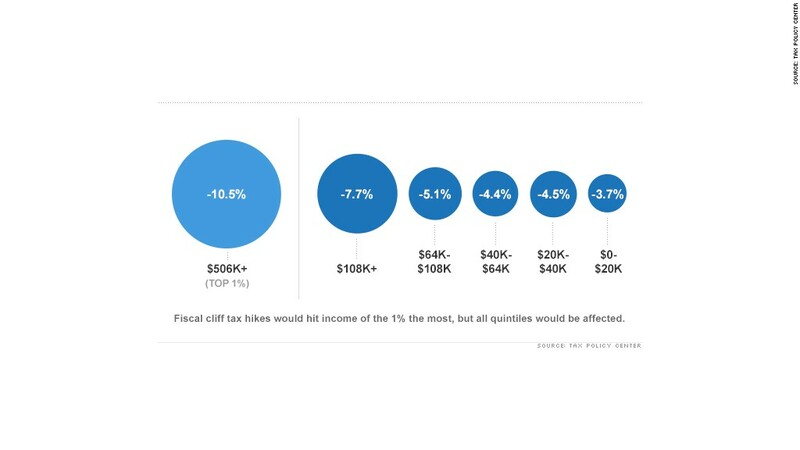 Sure, the rich would get hit hard by the fiscal cliff. But nearly everyone would feel the brunt of the tax hikes. "Going over the fiscal cliff will raise taxes on 90% of Americans," said Roberton Williams, a senior fellow at the Tax Policy Center. More than two-thirds of the poorest Americans, who make less than $20,000 a year, would have to shell out more to the Internal Revenue Service. The average increase would be $590. And pretty much everyone earning more than $40,000 a year would be affected. Middle-income folks, who earn between $40,000 and $64,000 annually, would see an average increase of nearly $2,000. And the richest folks, who earn more than $108,000, would face an increase of nearly $13,000. The fiscal cliff provisions are wide-ranging. The middle class, for instance, could see the 2% payroll tax holiday disappear. So someone making $50,000 might get about $83 less a month in their paychecks. Then there's the alternative minimum tax, which could strike roughly 28 million people, many of whom are in the middle-class. And of course, all taxpayers would be see an increase in tax rates. The low-income, meanwhile, would be hit by the scaling back of the earned income and child tax credits, which were expanded under both the Bush and Obama administrations. So a mother of two who earns $14,500 a year would see her entire $1,725 child tax credit disappear, according to Joel Friedman, a federal budget and tax expert at the Center on Budget and Policy Priorities. The poorest Americans would see 3.7% of their after-tax income disappear. While that's only half the amount the richest fifth of the nation would lose, the low-income often have fewer disposable funds at their command. "When you are at or near the poverty line, every dollar has extra meaning than when you are making a million bucks," he said. Related: What happens to the economy if we go over the cliff? The tax provisions are only one part of the fiscal cliff that would sock the middle class and the poor. More than 2 million people are scheduled to lose their unemployment benefits come January if Congress doesn't act, according to the National Employment Law Project. And another million would not be eligible for federal extended benefits when they run out of state coverage in the first quarter of 2013. Also, the automatic budget cuts set to take effect next month would likely fall heavily on programs that support the poor, such as Head Start and subsidized child care.